His Girl Friday is a 1940 American screwball comedy film directed by Howard Hawks, from an adaptation by Charles Lederer, Ben Hecht and Charles MacArthur of the play The Front Page by Hecht and MacArthur. This was the second time the play had been adapted for the screen, the first occasion being the 1931 film also called The Front Page. The major change in this version, introduced by Hawks, is that the role of Hildy Johnson is a woman. 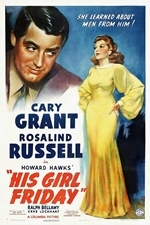 The film stars Cary Grant as Walter Burns and Rosalind Russell as Hildy Johnson and features Ralph Bellamy as Bruce Baldwin. The film was #19 on American Film Institute's 100 Years...100 Laughs and has been selected for preservation in the United States National Film Registry. Due to a failure to renew the copyright registration, the film entered the public domain in 1968; the 1928 play it is based on remains under copyright until 2024. Quentin Tarantino, the director of Pulp Fiction (1994), has named His Girl Friday as one of his favorite movies.